Two years ago, Karen introduced us to a mystical world of mermaids, selkies, sirens, and gorgons in Tangled Tides. I remember how excited I was to read another perspective on these creatures and I thoroughly enjoyed the story. 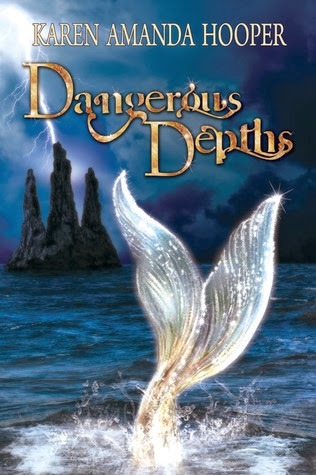 But let me tell you, Dangerous Depths far surpassed the first installment and has quickly become one of my favorite reads this year. Not only did we see growth and maturity in Yara, but we got to experience a different world entirely as Yara, Treygan, and Rowan travel to (get sucked into) Harte. Karen did a fantastic job describing the unique environment, albeit a scary one, and I also think she may have opened up the gate (ha!) to a spinoff with a certain coral-headed beast. (Okay, that would be my wish, Karen!) I found that I most enjoyed reading Rowan’s perspective. Whether that was because of the deep pain and desperation he felt, or if it was because I’m a sucker for selkies, either way, I enjoyed his chapters. And although Nixie’s part felt a little forced at first, it totally made sense about halfway through as to why we needed to see what was going on in her mind and in her world. I loved the addition of the sprites, the mythology behind them, and Nixie’s backstory – very creative. I found myself thinking about what might happen to everyone and couldn’t wait to carve out time to read. And the ending…ooh…I’m so ready for the next book now! The Good: Great world-building! Although it took me a little bit to remember all of the characters and where they were, I was completely fascinated with Rathe and Harte. The Issue: As I mentioned above, Nixie’s involvement (and whining) kind of distracted me from the rest of the story in the beginning, but she redeemed herself later on. The Rating: 5 conch! An exciting, heartbreaking, and enthralling tale sure to keep you up all night reading. And now for Karen's giveaway!